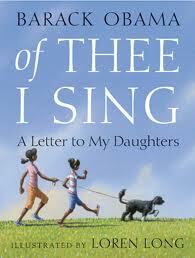 I can’t wait to see President Obama’s new children’s picture book Of Thee I Sing: A Letter to My Daughters, which is probably set to become a holiday best-seller, at least in some circles. The book spotlights 13 American icons who exemplify various virtues. The most unlikely subject: Billie Holiday–my muse but no role model. Holiday also figures into Obama’s pre-Oval Office memoir Dreams from My Father. As a youth struggling with identity, he found her music transcendent.